The House Chairman of the Committee, Rep Kevin Honan and the Senate Chairman, Sen Jamie Eldridge congratulated Jerry Halberstadt, Coordinator of the Stop Bullying Coalition after the Committee had taken a favorable vote. Halberstadt thanked Honan and Eldridge on behalf of all who urgently need protection, and on behalf all of the citizens and groups as well as legislators who have joined in the advocacy for this legislation. 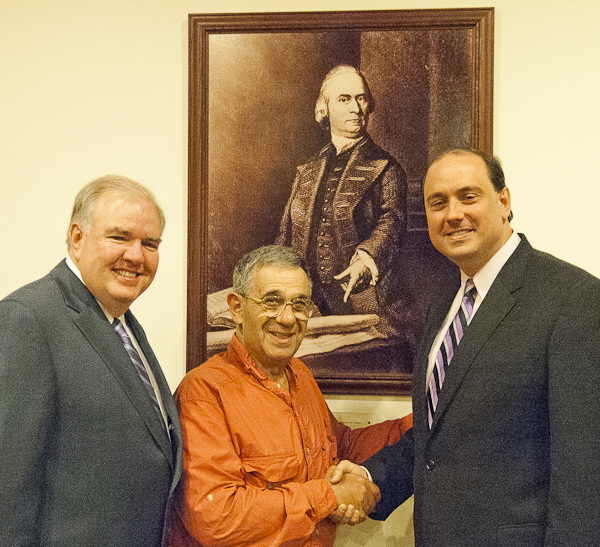 Under a portrait of John Adams, 2nd President of the US and a framer of the Declaration of Independence, Halberstadt (center) thanks Chairman Kevin Honan (left) and Chairman Jamie Eldridge (right) for their support. The resolve must go through other committees, and if approved, will go to the floor for debate and votes. The Commission will report back on its findings and recommendations by the end of 2015. The proposed legislation has received bipartisan support from legislators including Senators Joan Lovely and Bruce Tarr, and representatives including Brad Hill, Paul Heroux, Jay Livingstone, and Leah Cole, among many others. The problem of bullying in subsidized housing is a problem in many districts, and the effort to create legislation has begun to crystallize recognition and the desire to seek a remedy. Advocacy groups for people living with disabilities and seniors like the Independent Living Center of the North Shore and Cape Ann (ILCNSCA) have endorsed and supported this effort. Mary Margaret Moore, Executive Director of ILCNSCA, said "Civil and human rights need to be afforded to all, and currently those of us who are looked at as having less worth, specifically those living with disabilities as well as seniors, are still at risk of being treated like objects, controlled by others who have more cultural status, and thus receive societally condoned discrimination, abuse, and violence. This commission will hopefully be able to develop statewide, regional, and local strategies to stop the bullying, especially against those trying to live independently and productively in their own homes, regardless of subsidies." "This Commission will be able to shine a bright light into the dark places where bullying hides, and once again Massachusetts has taken the lead in seeking to protect the rights of all citizens," said Halberstadt. He added, "The Commission method is a great problem-solving process, bringing together for consideration interests, ideas, and solutions from many different angles and from all stakeholders. The Commission is a good method for solving complex problems through a process of discussion and negotiation—the essence of democracy." "Michael Kane, Executive Director of the Mass Alliance of HUD Tenants, has been a strong advocate for the rights of HUD tenants for decades, and his support and advice as a partner of the Stop Bullying Coalition have been central to our success to date," said Jerry Halberstadt. "The Commission signals important recognition by legislators and state agencies of the bullying epidemic that plagues so many tenants in senior and handicapped buildings," commented Michael Kane, Executive Director of the Mass Alliance of HUD Tenants. "We look forward to working with the Commission to develop comprehensive, resident driven solutions to this problem." The Commission will have six consumer advocacy representatives, appointed by the Governor from a panel of experienced and dedicated organizations including "the Massachusetts Association of Independent Living Centers, Jewish Family and Children’s Services, Massachusetts Alliance of HUD Tenants, Massachusetts Union of Public Housing Tenants, Stop Bullying Coalition, legal services organizations such as Mass Law Reform Institute and Disability Law Center, and individuals with direct experience and knowledge of the issue that can contribute to the commission." The Commission will bring together legislators, state agencies, and consumer advocates to understand the causes of bullying, to seek solutions, and to provide a report on their findings to the legislature with recommendations for action. They will gather information and testimony from experts, stakeholders, and the public, holding hearings in several parts of the Commonwealth. The work of the Commission is expected to raise public awareness of the problem of bullying affecting elders and disabled. Media: A text of the resolve and background information on advocacy groups is available at http://photoluminations.com/drupal/?q=node/164 (below). An Act A Resolve creating a commission to study ways to prevent bullying of tenants in public and subsidized multi-family housing. There is hereby established a commission to consist of 19 members, 1 of whom shall be the secretary of the executive office of health and human services, or a designee, who shall serve as chair of the commission; 1 of whom shall be the attorney general, or a designee; 1 of whom shall be the secretary of the executive office of elder affairs, or a designee; 1 of whom shall be the undersecretary of the department of housing and community development, or a designee; 1 of whom shall be the commissioner of the department of mental health, or a designee; 2 of whom shall be the chairs of the joint committee on housing, or their designees; 2 of whom shall be the chairs of the joint committee on elder affairs, or their designees; 2 of whom shall be the chairs of the joint committee on mental health and substance abuse, or their designees; 1 of whom shall be appointed by the minority leader of the house of representatives; 1 of whom shall be appointed by the minority leader of the senate; and 6 of whom shall be appointed by the governor, and shall be representatives of consumer protection advocacy organizations, such as the Massachusetts Association of Independent Living Centers, Jewish Family and Children’s Services, Massachusetts Alliance of HUD Tenants, Massachusetts Union of Public Housing Tenants, Stop Bullying Coalition, legal services organizations such as Mass Law Reform Institute and Disability Law Center, and individuals with direct experience and knowledge of the issue that can contribute to the commission. The commission shall study the prevalence and impact of the bullying of tenants, with a focus on elderly and disabled tenants, in public and subsidized multi-family housing. This shall include, but not be limited to identifying the conditions that give rise to and cause bullying; researching and investigating successful methods for preventing bullying in other contexts, including but not limited to schools, nursing homes, assisted living, the workplace, and housing. This research shall be used to identify and develop best practices; raise public awareness; and propose public policy recommendations and legislation necessary to protect tenants from harm and preserve their rights. The commission shall identify and invite to participate and contribute individuals with experience and knowledge of bullying in public or subsidized housing including tenants who have been victimized by bullying, managers who coordinate resident services, industry professionals and stakeholders, and individuals who have direct experience with bullying prevention. The commission shall hold public meetings in various locations throughout the Commonwealth in recognition of the difficulty some individuals may have in travelling long distances to attend commission meetings. The commission shall submit its findings and recommendations with the clerks of the house of representatives and senate, the joint committee on housing, the joint committee on elder affairs and the joint committee on mental health and substance abuse not later than December 31, 2015. The Stop Bullying Coalition grew out of efforts to create legal protections against bullying in subsidized housing. Based on a right of petition established in the Constitution of the Commonwealth, Halberstadt, with help from Michael Kane and input from many others, including targets of bullying, submitted a petition and bill to the legislature. This became a bill, S604, submitted "by request" by state Senator Joan Lovely at the beginning of the current legislative session in January 2013 (188th, 2013-2014). Although the bill had a very positive reception when terstimony was presented to the Joint Committee on Housing, it needed additional work before it could be voted out of committee. Rep Brad Hill suggested creating a commission in order to keep momentum and create the basis for a stronger bill. The new resolve was written in cooperation with Kurt Stiegel, Research director for Rep. Kevin Hogan, Chairman of the Housing Committee and Halberstadt, with input from other advocates and the guidance of John Horgan, Legislative Aide to Senator Lovely. The Independent Living Center of the North Shore and Cape Ann Inc. (ILCNSCA) is a service and advocacy center run by and for people with disabilities. "Services and Advocacy for an Independent Life" ILCNSCA supports the struggle of people who have all types of disabilities to live independently and participate fully in community life.